Our state is THE optimal place for Arizona birding. With over 300 plus days of constant sunshine, you have plenty of opportunities to be singing alongside with them! If you want to find AZ birds, you will have the opportunity to discover over 500 species to keep you coming back for more... enthusiasts can experience the many varieties because they can be found virtually in every section of the state. Cardinals, ducks, roadrunners, hawks, hummingbirds, eagles, owls, quails, and of course, our state bird, the Cactus Wren, are just several of the hundreds waiting to be discovered! Our state bird, the Cactus Wren, is seven to eight inches long and it likes to build nests in thorny desert plants that help protect its nest. It is common for the Wren to build a nest in the arms of a Saguaro Cactus. Through my many hikes around the desert, I have seen plenty making themselves right at home inside a cactus! I found it interesting to learn that they will actually build many nests but it will live only in one. The rest of its nest are simply decoys. 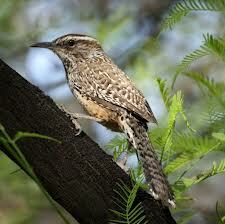 The Cactus Wren, also known as Campylorhynchus brunneicapillus aquired its name back in 1931. Arizona later adopted the Cactus Wren as its state bird in 1973. The name actually means curved beak. The Cactus Wren is the largest Wren that exists in North America. The Cactus Wren is pretty easy to find, at least hear, as they are known to be quite noisy. If they happen to be building a nest, they will surely let you know they do not appreciate your presence with what some believe sounds like screaming. There is an organization known as the Southeastern Arizona Bird Observatory (SABO) that provides enthusiasts with a guide to some of the Arizona hot spots. This service is offered to the community and is sponsored by SABO's members and donors. If you find this information useful, you will have the choice to become a member. If you prefer, you can just make a donation to help this organization continue its services. If you would like to learn where some of these hot spots are located or would like to learn more about this organization, you can find it at the Southeastern Arizona Bird Observatory. Cactus wrens measure approximately 7-9 inches in length and can be found at elevations below 4,000 in elevation. I can attest to the fact they are quite common in populated areas as I constantly see them where I live as well as many other areas. I really enjoy watching them and look forward to seeing them every day... and so do my cats! Not being a native of the desert southwest, I am amazed at just how many different birds that actually reside in this beautiful state. I particularly love seeing the roadrunners, eagle, and the cardinals! I have seen many roadrunners and cardinals but I have only seen a few eagles. I was able to see the eagles in the northern part of the state where they are more common. See my video below of a cardinal hopping around just outside the patio. If you would like to learn more about birds that make AZ their home as well as other animals and fish, along with hunting information including permit information, see the Arizona Department of Game and Fish.